How Does Sleeping Position Affect our Health? Weighted Blankets - Gravityblankets UKBlogHow Does Sleeping Position Affect our Health? Sleep is a very important pillar of our daily cycle – after all, it constitutes one third of our life. As we know the lack of nightly rest affects our health, mood and even relationships with other people. On top of that, not only the quantity and quality of sleep but also the sleeping position affects our brain and body. Although in most cases we intuitively fall asleep in one position, certain self-control in this matter can solve many problems. Why is that so? During sleep, a number of regeneration and cleaning processes take place in our body. One of the most important functions of sleep, essential for our health, is the removal of toxins from the brain. The accumulation of harmful substances in this region leads to many neurological diseases, such as Parkinson’s disease or Alzheimer’s syndrome. The glymphatic system, which regulates the flow of cerebrospinal fluid, is responsible for successful brain cleansing processes. It works in a similar manner as the lymphatic system but it is managed by glial cells and becomes most active at night. Researchers from Stony Brook University in New York conducted a study to show in which position the work of the glymphatic system is the most effective and the brain is most thoroughly cleansed of toxins. For this purpose, an MRI of rats lying on stomach, in lateral and in supine position was done. It turned out that the lateral position significantly facilitates the transport of cerebrospinal fluid, and the rats sleeping in this position got rid of harmful substances most effectively. Interestingly, most people and animals instinctively take such a position during sleep. Researchers claim that it is a targeted, subconscious action of our body to improve and accelerate the processes of cleansing and excretion of toxins accumulated during the day. So, we can feel lucky if the lateral position (on the side) is our favourite one. It is however important to distinguish between the side and “foetal” position, in which we pull up our legs by lifting knees to the chest. In the latter case, we run the risk of great discomfort in the morning and during the day. Why is it so? In that position our whole body is compressed – the stomach and adjacent internal organs have no room to freely spread which can cause their underoxidation. In this case, the morning will be unpleasant, and ailments such as flatulence can make our whole day difficult. What is more, this position puts high pressure on one of the hips, and the spine bends unnaturally. Sleeping on the belly is also not recommended, as it puts pressure on the stomach, pushing gastric acids up the digestive tract. This will lead to reflux and burning throat in the morning. Additionally, this position puts a heavy strain on the thoracic cervical spine which practically always leads to neck and upper back pains. It can also trigger breathing problems which often lead to circulatory issues and arrhythmia. Sleeping on the stomach hinders the flow of spinal fluid into the spine, so it may lack proper cushioning during the day. Sleeping position control is not hard for healthy people and it can be learned. But what if we are struggling with disorders making us frequently change our body position by waking up, sleepwalking or problems with falling asleep? In such scenarios we should start from the basics, i.e. sleep hygiene. Although for many of us it seems trivial, maintaining regularity in simple pre-sleep activities can be really helpful over time. Scientists repeat it like a mantra: no electronic equipment such as computers, TVs or cellphones in the bedroom. If you think that browsing your favourite website in the evening or watching a series helps you to fall asleep sooner, do not forget that it works only in the short term. In the long run it will result in insomnia, morning irritation and a feeling of sleepiness. If, despite efforts, you still have problems with sleep hygiene, try to check your bed. Get a mattress which matches your needs. Check if the blanket and pillow do not cause allergies or discomfort. Recently, weighted blankets with a heavier, specialised filling have been gaining great popularity. Most importantly, they can be used not only by children but also by adults who want to reduce tension and stress. 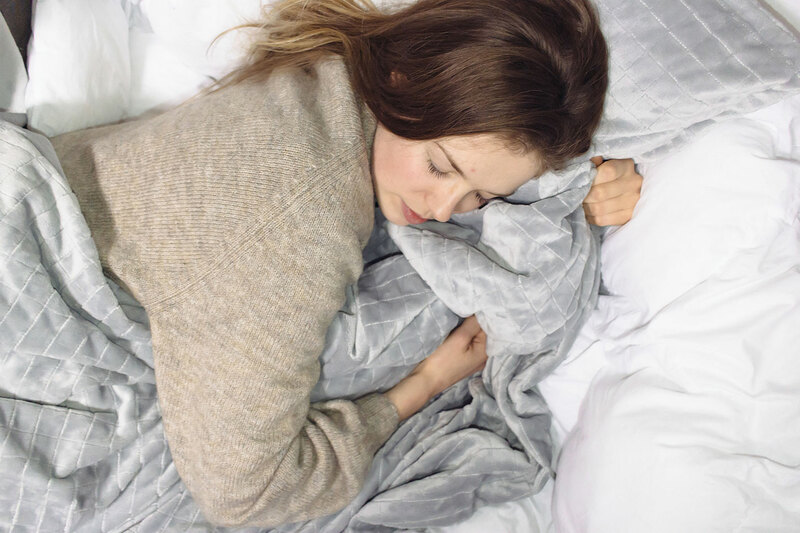 Weighted blankets provide an instinctive sense of safety which often lies at the root of the accumulation of tension at night.